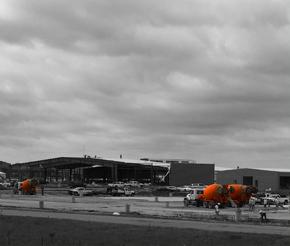 L.A. Jacobson Inc. is the premier ready mixed concrete producer serving South Central Oklahoma. Our goal is to be first in QUALITY, fastest in SERVICE, and fairest in VALUE. We look forward to the opportunity to do business with you. 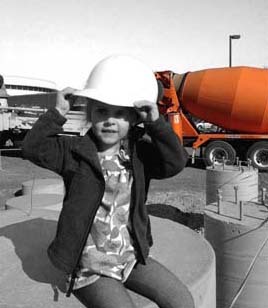 Founded in 1945, L.A Jacobson, Inc. is Oklahoma’s oldest family owned ready mixed concrete company. 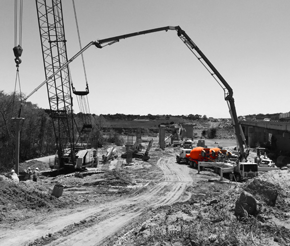 With multiple locations, as well as portable batch plant capabilities, Jacobson has the resources to service your project. L.A. Jacobson, Inc. is now in its fourth generation of ownership and there are few companies nationwide that can boast the same level of experience and expertise. We strive to be attentive to our clients and are always available to address any questions or concerns they may have. Our goal is that our customers are satisfied with the quality of both our product and service from large commercial and industrial projects to small residential jobs. 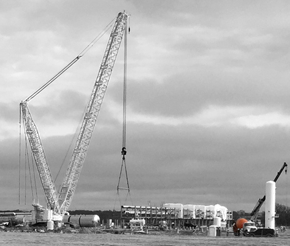 The ownership is actively involved in all aspects of day-to-day operations. "Hands-on" is how we drive success. 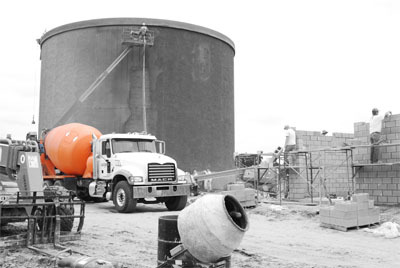 With multiple stationary plants and portable capability, rest assured that L.A. Jacobson, Inc. will provide high quality concrete when you need it. 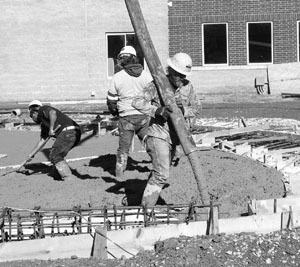 Rising temperatures, high winds, and/or low humidities can create a poor curing environment for ready mix concrete. These problems are easily remedied and we would be glad to discuss options to make your project successful. Always make sure to consider environmental conditions both before and after your pour. These tools are provided for your convenience. Should you have questions regarding a specific project, please don't hesitate to contact us. 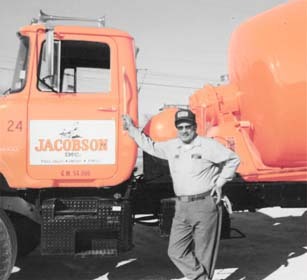 L.A. Jacobson, Inc. traces its roots to the mid 1920s when L.A. “Jake” Jacobson and his brother Carl E. Jacobson entered the road building business in northwest Kansas. 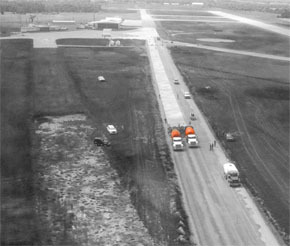 With the onset of World War II, L.A. and Carl joined the war effort by contracting earthmoving projects at the Army Air Force bases in Oklahoma. They first came to Pauls Valley in 1944 to construct the levee along the west side of the town that continues to protect the community today. Recognizing an opportunity with the emerging oil fields in the area, L.A. decided to expand into ready mixed concrete in 1945. 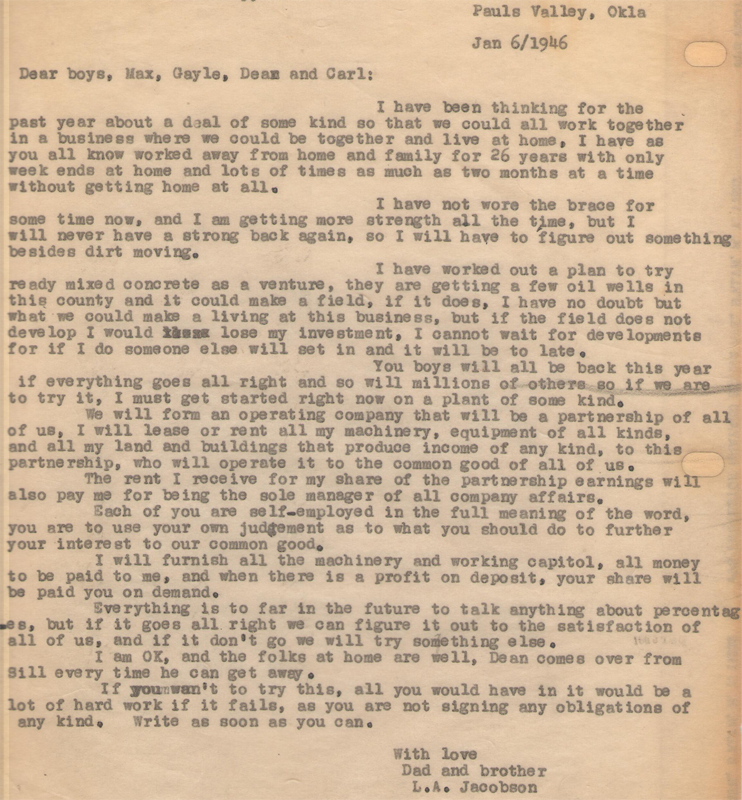 Writing to his brother Carl and three sons – Max, Gayle, and Dean in January of 1946, L.A. invited them to join him in his new venture. 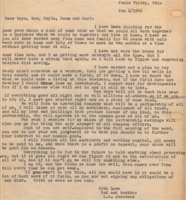 At the time, Max and Gayle were both away at war, and Dean was stationed at Fort Sill. Carl and the three brothers agreed to join him, and the Jacobson family relocated to Pauls Valley. 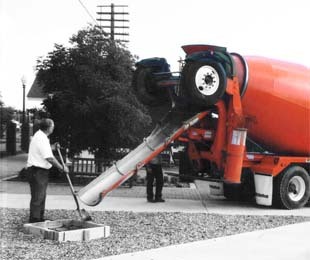 The concrete industry in the 1940s looked very different than it does today. Materials were stockpiled using dozers and cranes. Cement was in sacks rather than in bulk and was unloaded by hand from incoming rail cars. 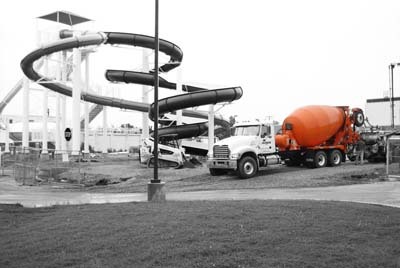 Initially, they had no equipment resembling a modern concrete plant. 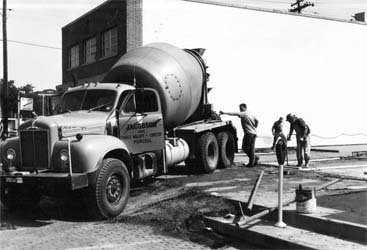 Many of Jacobson’s first mixer trucks were repurposed military trucks bought at surplus after the war and had only 2 cubic yard capacities. It was hard work with long hours. Often they would work all night on equipment to have it ready for the next day’s work. The Jacobsons also continued to contract road and street projects, as well as general construction projects for many years. In the 1950s, 60s, and 70s, L.A. Jacobson, Inc. expanded by adding plants in several of the surrounding communities. At the time, the limitations of the equipment necessitated having numerous plants spaced at small intervals. 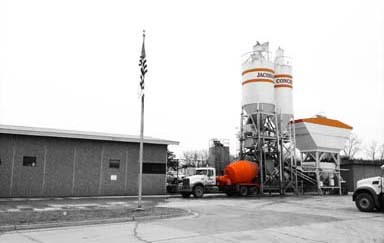 Jacobson's has had concrete plants in a number of towns including: Pauls Valley, Lindsay, Maysville, Purcell, Elmore City, Marlow, Randlett, Pumpkin Center, Stratford, and Wynnewood. They also added sand plants on the Red River near Temple, and east of Pauls Valley. 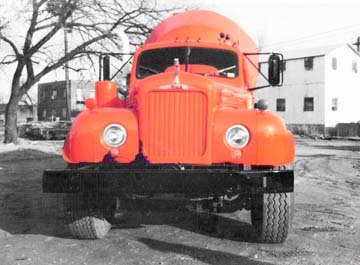 Through the years trucks continued to increase in size, rendering many of these plants unnecessary. Today L.A. Jacobson, Inc. has plants in Pauls Valley, Lindsay, Purcell, Stratford, and Wynnewood. 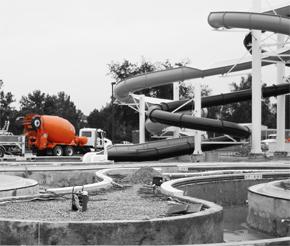 As with any industry, the ready mixed concrete business has continued to evolve. 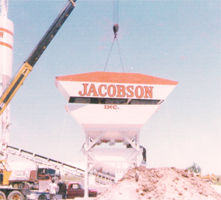 Jacobson’s now utilizes state of the art technology including automated concrete plants and batch controls. 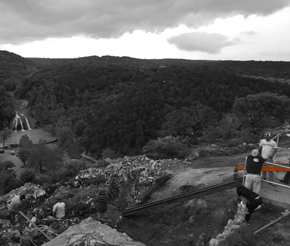 Conveyor belts and hydraulic end-loaders have replaced cranes and dozers. 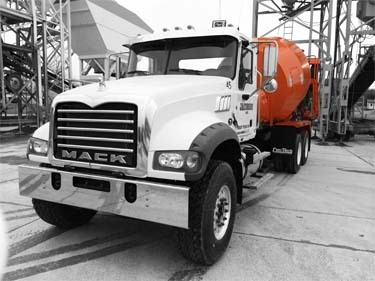 Rail transportation has given way to trucking and mixer trucks are now capable of hauling five times the load they once did. All of these advancements have allowed Jacobson’s to continue to improve quality and service. 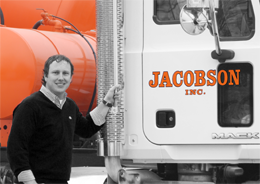 Ownership of the company has continued exclusively within the Jacobson family. 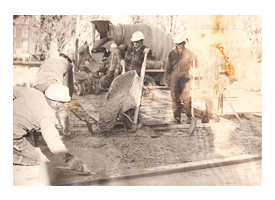 As a result, it is now in its fourth generation making it the oldest family owned ready mixed concrete company in the state, and one of the oldest in the country. Not only is Jacobson’s a multi-generational company, many of its customers are as well, thus forming relationships that have lasted decades. In 2019 L.A. Jacobson, Inc. is celebrating its 74th anniversary. However, it is not the company’s storied past we are most proud of, but its promising future. Jacobson’s continues to be a thriving business, is an active member of the communities in which it operates, and vital to the local economies. © 2019 L.A. Jacobson Inc.